Available in size: 6"x3", 6"X 4", 8"X3", 8"X4", 8"X5"
- Heavy cast iron round shape. These designer wooden tripod table lamps come with a black wire cage light shade. They have a brown braided textile cord that is 230cm long with an inline on/off switch for ease of use. The lampholder takes a standard bayonet B22 bulb. 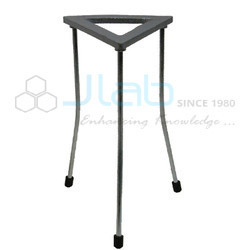 Tripod Stand MSW-105LE: With rich industry experience and knowledge, we are providing an excellent quality range of Tripod Stand. With rich industry experience and knowledge, we are providing an excellent quality range of Tripod Stand. Tripod Stand: Cast iron having black powder coated top zinc plated rod and plastic feet.